Probably Sport Auto did 0-100. Real testers at Car and Driver 0-60. How does a car that runs 0-60 in 5.4 take 6.1 to hit 62mph? Oh and the curb weight here is wrong. The correct curb weight is 3152 lbs as people have pointed out. @oxmanblaze well, I think most people on this site want the stats to be accurate. The listed curb weight is too high, I agree. I usually trust the scales used by Car and Driver. They weighed a Mazdaspeed 3 in 2007 at 3180 lbs. I don't know the source for the listed weight of 3267 lbs. As for the 0-200 kph time, I don't know which magazine test it is from. The Mazdaspeed 3 is a bit tricky to get the best performance. Apparently, one has to shift at 6000 rpm, rather than at the 6700 rpm redline. The test driver may not have known that, and it would have adversely affected the test results. For comparison, Car and Driver shifting at 6000 rpm and using its test procedure which includes a one foot roll out, reached 120 mph in 21.9 seconds. 200 kph is of course 124 mph, so it probably needs another 2 seconds to go the extra 4 mph. Maybe around 24 seconds flat? In other words, the 0-200 kph time isn't that far off, especially if the magazine doesn't use that silly one foot roll out thing. Yeah the curb weight is WAY off here... Curb weight is in FACT 3152lbs NOT 3267lbs. That 0-200KPH time is slower than actual as well. Nobody seems to care about accuracy so I suppose it doesn't matter. have you tried to carry one ton and a half? is it heavy? 3152 pounds and 263 HP is "Heavy as hell" ? The GTI which has just 210 HP weighs 3180 pounds ( on here it's listed at 2900 pounds) for some odd reason but regardless 3152 pounds isn't "heavy as hell for a car which produces 263hp and 280 ft-lb torque. Okay where's the link to correct the "weight" ? This car "2007-2009 Mazdaspeed 3" or "3MPS" DOESN'T weigh 3267 pounds! This car weighs 3152 pounds. 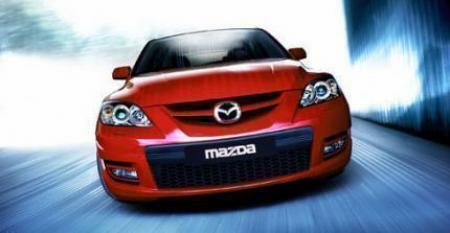 The "2010 + Mazdaspeed 3" or "mkII 3MPS) weighs 3270 pounds / about 120 pounds + the 1st generation Mazdaspeed 3. Yeah the correct weight for this car 2007-2009 Mazdaspeed 3 / 3MPS is 3152 lbs or 1429kgs. Why hasn't anybody corrected this? It's been pointed out like a million times already. F@ck the loans! Banks are the enemies of the humanity! Where is the option to put the correct curb weight and weight distribution? I mean people have been pointing out the correct curb weight 3152 lbs NOT 3267 lbs yet nothing is being done.. Does the site not care about accurate stats or what? This car simply isn't 3267 lbs so it should be correctly to the it's true curb weight of 3152 lbs and or whatever that is in KGs. This models curb weight is 3152 lbs NOT 3267 or 1485kgs. This car has consistantely posted 0-60 times in the mid / high 5 sec range (5.4-5.8). Why it would take 6.1 sec to reach 62mph doesn't make sense because the same number of shifts (3) @ 5700rpm are required either way. As stated before the Euro's apparently weren't aware of the optimum shifting points for the car and hence the slow by comparison KPH vs. MPH times. A car that is capable of 5.4 0-60 with 3 shifts can without a doubt do much better than 6.1 seconds to reach that extra 2mph. A far more realistic 0-100kph time would be 5.5-5.7 seconds, 6.1 makes no sense. Last but not least the curb weight list 3267 / 1485 kgs is WAY OFF. That should be corrected to 3152 lbs. The Mazdaspeed3 (3MPS) requires three as in (3) total shifts to reach 60 / 62 mph. Redline is 6700rpms but you shift this car at roughly 5700-5800 rpms for the quickest acceleration because the power drops off far before 6700rpms on stock tune. I know this as FACT and the car can indeed hit 60mph in 5.4 seconds so 6.1 to 62mph (0-100kph) makes no sense whatsoever. It's the same number of shifts (3) @5700-5800 rpms either way. I cab only guess the UK sources aren't aware of the correct shifting points and hence the bizarre slow 0-100; 0-200kph times. Also yeah the cars weight is 3152 lbs not 3267 lbs as listed here. I notice people keep correctly pointing this out but it's not changed.. What's the reason for that? We want accurate stats in here right? Per Mazda the car weighs 3152lbs but regardless the weight listed 3267lbsis WAY off. This car "Mazdaspeed3 / 3MPS" doesn't weigh 3267lbs. The weight currently listed 3267lbs is 115lbs more than actual. You see the 263hp / 3152lbs (2007-2009) Mazdaspeed3 we have here in the states runs well under 6 sec 0-60 (5.4s) and the 1/4 in 14.0@101mph. 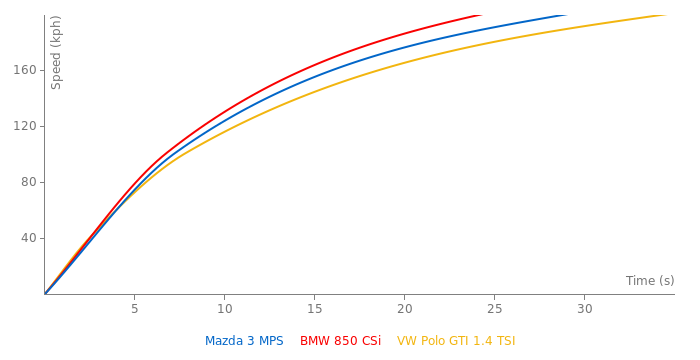 So if the 3MPS (euro spec) is actually rated at a lower 256hp vs. 263hp and heavier 3267lbs vs.3152lbs than that could possibly explain the seemingly asissine slow 0-100kph / 0-200kph times posted in relation to the posted 0-60, 0-100, 0-120 and ¼ mile times of the U.S spec version Mazdaspeed3. Well where I come from the car makes 263hpbut regardless it doesn't make sense that the car can run 0-120mph in 20.7 but basically comes to a halt and takes another whopping 4.4secs to reach 124mph. Realistically the real number is probably closer to 22.5 - 23.0 sec at worst. Also, I see nobody is changing the weight.. Is the Euro spec 256hp 3MPS actually 110lbs heavier (3267vs.3152lbs U.S version) than the U.S spec 263hp Mazdaspeed3? If so maybe that explains why the acceleration times are slower. "It's bizzarre to think it would take an another whopping 4.4 sec to go that extra 4mph. It's simply untrue." Its not out of the question that a 256 horse car would take 1.1 seconds to gain 1mph at 120mph. Either way it's really no big deal but there are some things that are OBVIOUSLY wrong / don't make sense here. Like before when it was posted that it took the car 14.5 sec to hit 100mph but somehow did the 1/4mile in 14.2@100 and so on. *correction ISN'T exactly 120mph but 124.2mph. Reviewing the 0-100 and 0-200kph results it shows the Mini cooper (0-100kph) being right behind the 3MPS which is just silly. And the idea that a MkV R32 would be anywhere near a 3MPS up to 200kph is laughable at best. It's not a "forum claim" it's Car and Driver. You simply have to go to the forum link to open the source for Car and Driver. You're right 0-120mph is exactly 0-200kph (124.27mph) but you're crazy (no offense) if you think it takes the 3MPS an extra 4.4 sec to reach 124mph. The 2007-2009 3MPS is simply A LOT quicker than 25.1 sec from 0-200kph period. 3.Again, the 3MPS (Mazdaspeed3) has recorded a 20.7 0-120mph tested by Car and Driver. It's bizzarre to think it would take an another whopping 4.4 sec to go that extra 4mph. It's simply untrue. And lastly as I mentioned about the 0-100kph time of 6.1 it's FALSE. How on earth does a car that runs 0-60 in5.4 sectake an extra .7sec to reach 62mph? It makes absolutely ZERO sense. And since ONLY the 0-100kph and 0-200kph times are used when comparing cars the results are invalid. Basically the site is under rating the hell out of the 3MPS / Mazdaspeed3. And I'm not saying it's just the 3MPS but other cars as well. I think we could use a bit of common sense a round up / down according to the posted results. And lastly the weight and weight distribution listed for this car is DEAD WRONG. your link does not work and we don´t change any numbers because of some forum claims. 200km/h are 125mph not 120mph!! in my eyes that fits perfectly and 25.1s is 100% correct! 0-200kph time is 20.7 sec NOT a whopping 25.1 secs. Car and Driver (Link below) recorded 20.7 sec 0-120mph or ~ 0-200kph. realistically you can figure it should take at the most 5.5-5.6 sec for the 3MPS to go that extra whopping 2mph from 0-62mph (0-100kph). 6.1 don’t make sense. That's important to note because ONLY the 0-100kph (0-62mph) time is used when comparing cars. It's not doing the car justice. The results currently posted on this site are the weakest I’ve ever seen for a 1st gen Mazdaspeed3 or 3MPS as it’s called in the UK. The car is a lot quicker than that and weighs a good 110lbs less than 3267lbs. It's actual curb weight is 3152lbs. Weight distribution is closer to 61/39 as well NOT 64.1/35.9.